Geeks Gone Raw : GameEnthus Podcast ep154: Console Yourself! or 8 is enough? GameEnthus Podcast ep154: Console Yourself! 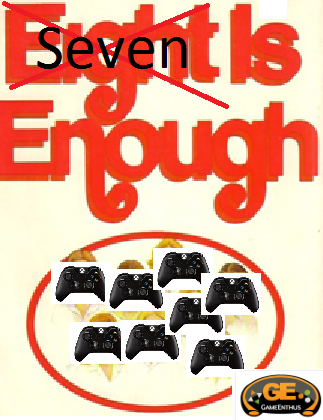 or 8 is enough? Parris(@vicious696) from Gamertag Radio and Remember When is moving onto new things and he's taking Battlefield 3 with him. Robert aka Desert Eagle(@tech_gaming) from Tech-Gaming has come down with Disney Infinityitis. Henry(@KNOXbroadcast) from Knoxbroadcast and Open Forum Radio is doing big things and closing deals. Mike (@AssaultSuit) is out this week. David(@Tiny415) enjoys going through the Disney classics while playing Pokemon and Aaron(@Ind1fference) is now afraid of his cat. Topics: Pax Prime, The World's End, Rayman Legends, Diablo 3, The Butler, Kickbeat, Rise of the Guardians, 2DS, Hatsune Miku, ExtraLife, PSN store, Plants VS Zombies 2, Plants VS Zombies Garden Warfare, Halo Global Championships, Sonic Dash, The Last of US, Disney Infinity, Bollywood Wannabe, SuperFrog HD, Disgaea D2, SteamWorld Dig, Metal Slug, Neo Geo Gold X, Battlefield 3, Madden 25, Killzone Mercenary, Pokemon Black, Star Wars Pinball, Dance Central, Wii Sports, Do Not Fall, Castle of Illusion, Kung Fu Strike, TMNT Arcade game, Puppeteer demo, Freefall Racers, Mighty No.9 and more.